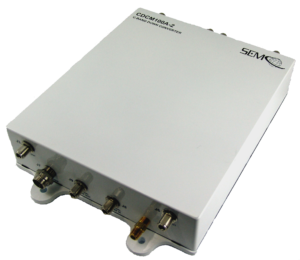 SEMCO's rack-mount and antenna pedestal-mounted RF Down-Converters are designed for use with antennas that employ tri-band feeds (L, S and C-Band). These Down-Converters have an L Band (1415 to 1850 MHz), S Band (2185 to 2485 MHz) and C Band (4400 to 5250 MHz) RF input and provide L-Band, S-Band and down-converted C-Band (300 to 1150 MHz) outputs. They use an internal 10 MHz reference clock, as well as provide for the use of a customer-provided external 10 MHz clock. These down-converters exhibit excellent spurious response and image rejection characteristics and are IRIG 106-11 Tier II phase noise compliant. The pedestal-mounted module is an IP67-rated pressurized module with the same excellent performance and features of the rack-mount 1U unit, with the added ruggedized design to withstand the harsh environmental conditions encountered when mounted to an antenna pedestal.